Interested in taking a few snapshots of the likely auroras from the recent solar flare the Sun sent our way? It's reported that we'll have the biggest solar radiation storm in over 7 years thanks to the Earth-directed CME (coronal mass ejection). But if you live in the right place, and just happen to be outside at the perfect time (9 a.m. EST tomorrow, give or take seven hours), you might just witness a beautiful auroral display. If you don't want to wait outside all day, follow in the footsteps of Alexander Avtanski, who built a DIY magnetometer to measure disruptions in the Earth's magnetic field. Alex calls his project a torsion magnetometer. In the magnetometer setup, two mirrors are strapped back-to-back on a magnet connected to a string. 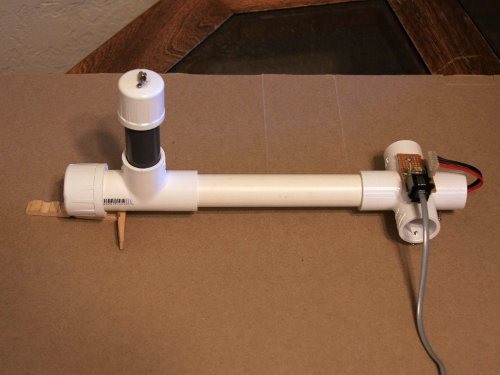 A cheap laser pointer shines a laser onto a mirror, then is reflected back to an array of sensors—a pair of photoresistors encased in PVC pipe. Changes in the Earth's magnetic field move the mirror, twisting the thread, changing the laser position on the sensor, which is then recorded and plotted on a chart. If just happen to have all the material ready (and the time to do it), then you might just be able to record the auroral activity from tomorrow morning's geomagnetic storm. To see exactly how it works and how to build it, check out Alex's details and instructions. If you want, you can just skip to the schematics to see how the sensor works. News: Taking the world by storm! News: Dress Your Windows Up with Drapery! Do it! Let us know how it goes.